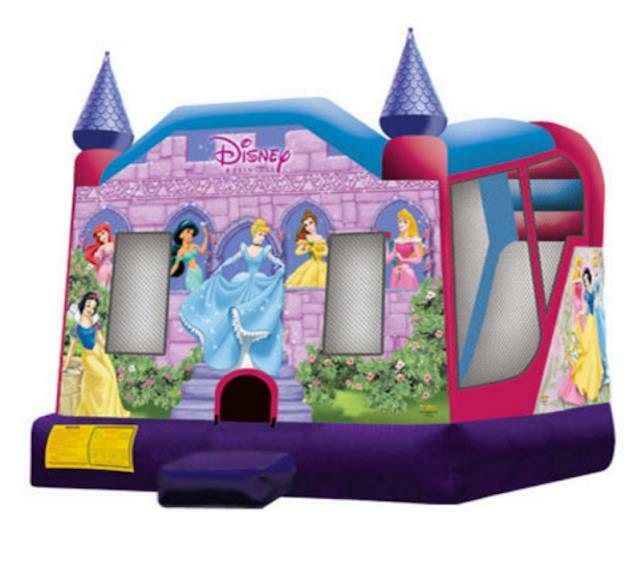 This licensed Disney Princess inflatable jumper combo injects the latest in fairytale fantasy to any event, Each participant is welcomed by Ariel, Cinderella, Tiana, Belle, Jasmine, Aurora and Snow White, dressed in their princess best! Visitors will engage in enchanting play inside this inflatable jumper with one of four activities, including a fantastic wet or dry slide. **includes (1) blower and (4) stakes. * Please call us for any questions on our princess wet/dry slide/bouncer combo rentals in Rocky Mount and Wilson NC.